Courtesy of Fontaine Realty Group, Inc, Ron Fontaine. Fully remodeled 3Br, 2Ba, 1500 esf in College Area. Open floor plan/move in ready. Wood plank flooring, subway tile in kitchen & baths, custom light fixtures and so much more! So much attention to detail. Spacious living room with fireplace has access to giant patio and backyard through beautiful French doors. 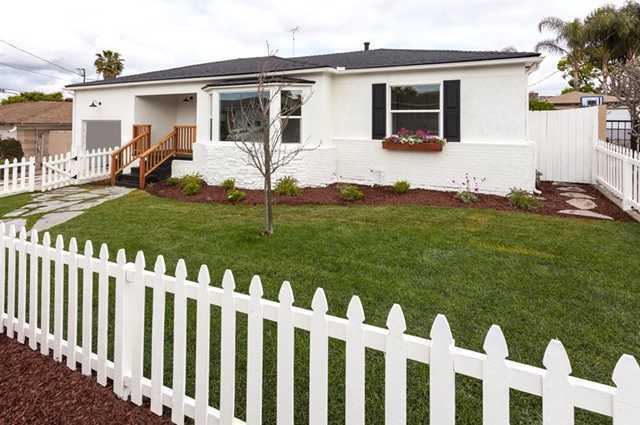 Single car attached garage with storage, tankless water heater, and a white picket fence! Walking distance to SDSU, shopping, park, and easy freeway access. Welcome Home! Please, send me more information on this property: MLS# 190018103 – $659,000 – 6150 Estelle St, San Diego, CA 92115.